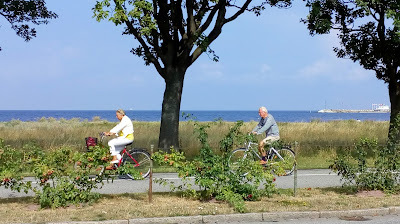 In this week's blog, I take a look at life away from the centre of Malmö out in the suburbs. It's always interesting to see what is going on away from the more famous parts of a city after all! Now I didn't get to cycle round all of the suburbs, but I think what I found was pretty representative and it gives a flavour of what was going on. 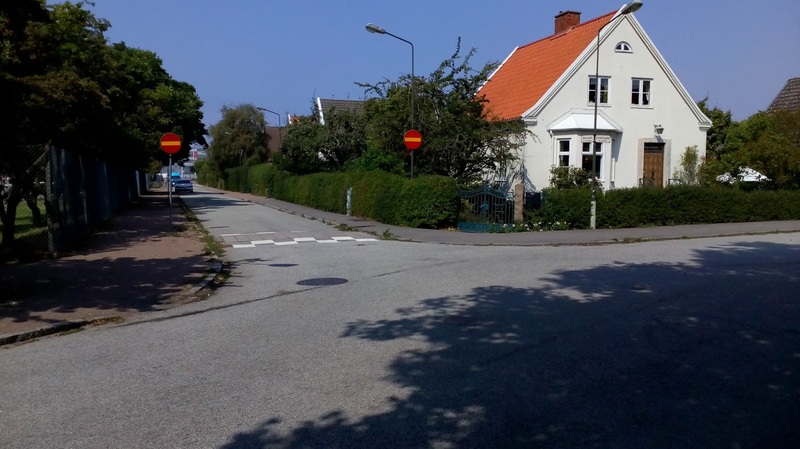 We stayed on the edge of the neighbourhood of Sibbarp which is about 6.5km (4 miles) from the city centre and probably serves to show that Malmö isn't a massive place. Sibbarp sits in the shadow of the stunning Øresund Bridge with a campsite at one end and a huge public park running along the coast. Of course, cycling is welcomed in the park, although I did notice the dd barrier. The 'fingers' were reasonably spaced, but it would have been a pain to get a cargocycle or adapted cycle through. Luckily, most of the access points didn't have them. The park has a completely separate cycleway and so the mixing of people walking and cycling is limited to crossing points. 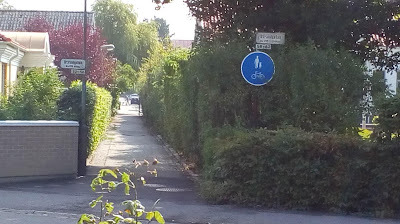 The route is smooth (for walking and cycling), well-lit and clearly signed. The park isn't especially a route for travelling through, more of a pleasant diversion from the street, although it was a useful cut-through from the campsite. 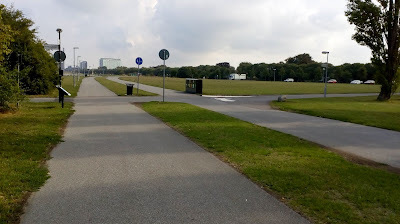 At the north end of the park, the route turns back to the main road along the coast, Strandgatten (or beach street). 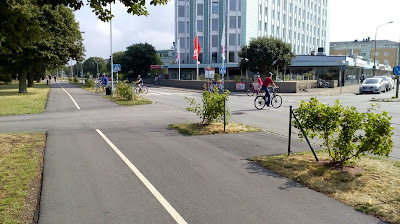 As it joins the main road there is a zebra crossing linking to a street on the other side of Strandgatten (Skånegatan) with a parallel cycle crossing, although people cycling give way to traffic here. 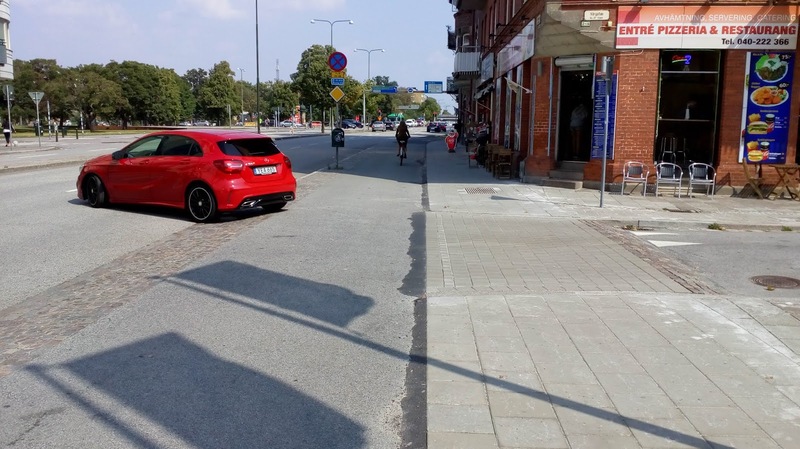 The access to the residential street is interesting in its own right because it's a modal filter with pedestrian priority (second photo below). 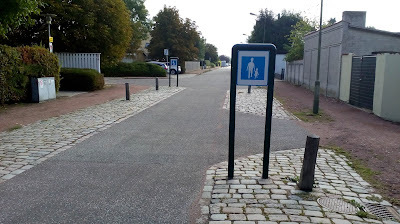 Although there is a cycleway in the centre of this traffic-free link, I'm guessing the signage is to help people cycling to remember that there are people around - the footways either side are actually made from self-binding gravel which isn't as good as asphalt to walk on. 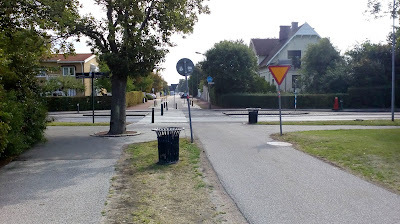 In fact, there were lots of footways finished like this around the suburbs (above) which is a curious choice. 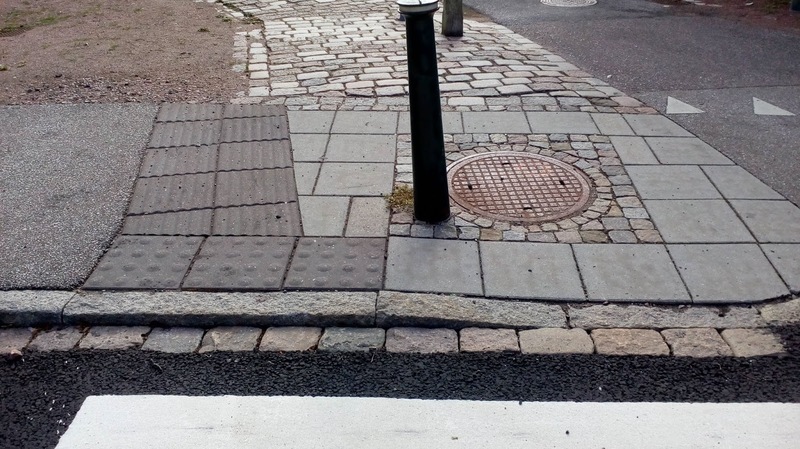 The tactile paving and dropped kerb detail (above) was completely different to the UK, but quite interesting. 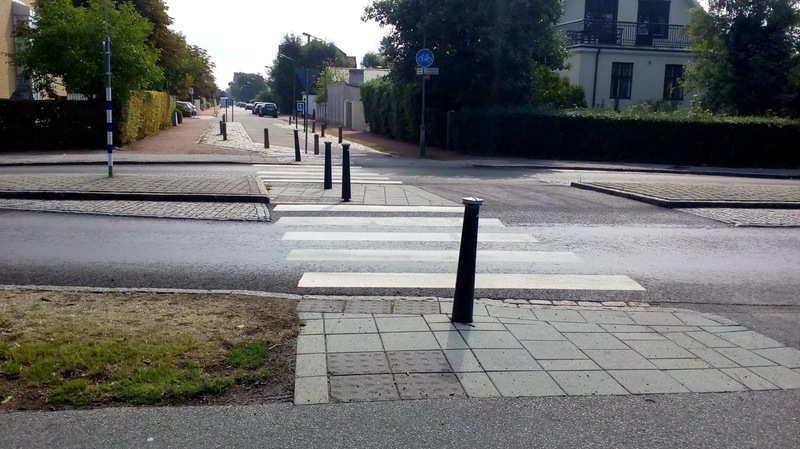 For people needing a flush surface, there is a dropped kerb, whereas the tactile paving is to show a kerb with an upstand ahead. 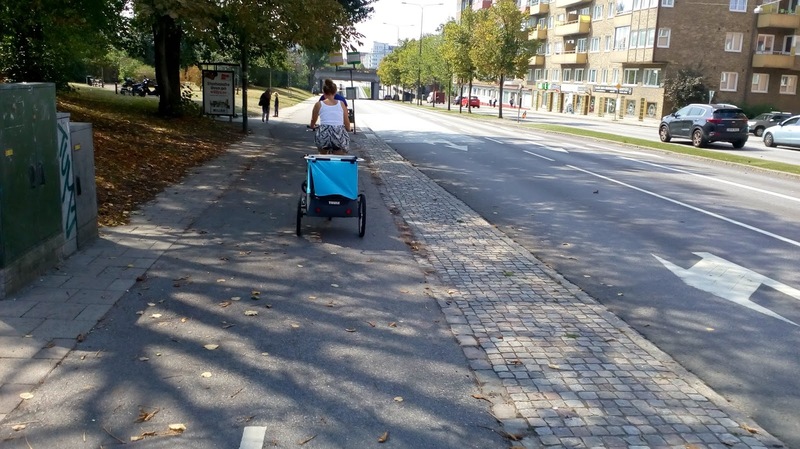 In reality, I can see that people using wheelchairs or mobility scooters would just use the cycleway. 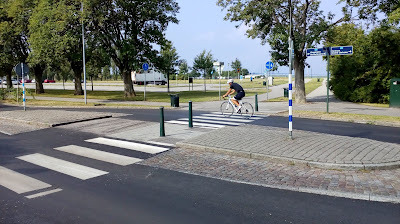 This particular crossing also had a wide central island so that people can cross in two parts and the guy cycling clearly had an issue with the cycle route along the main road which I'll mention in a minute. The crossing point also has some tight geometry for drivers to get round to make sure speeds are low approaching the crossing. 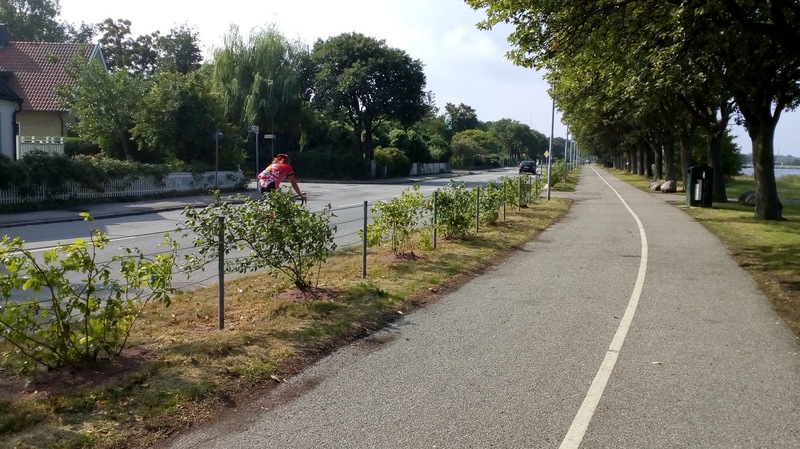 The cycleway along Strandgatten is essentially shared-use with a line down the middle. It does the job and it's nicer to use than the road, but it's not exactly world-class. A good test of infrastructure is who uses it. Clearly it's fine for the pootlers (above), but the roadies (below) prefer the road! 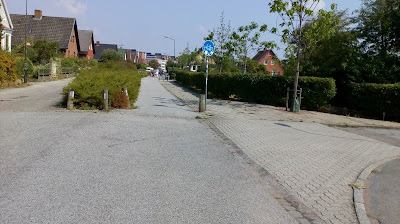 The hedgerow between the cycleway and the road was a nice addition, but unfortunately, if you want get to the cycleway from the houses opposite, you have to go and find a gap at a side street or an alleyway (below). Below is a photo of the junction of Strandgatan with Västra Bernadottesgatan which leads to a local supermarket and a larger residential area beyond and within which, there is less filtering and nothing to protect people cycling. There is no protection in the junction, so it's find a gap and go, although the road itself was very quiet as it only serves a limited area. 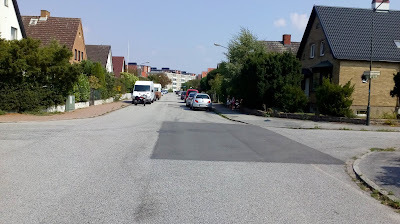 Further north and we have Limhamnsvägen which on one side of the street has some significant construction work. In common with some other parts along the coast, there is regeneration work going on where old industry is being replaced with housing and commercial development. 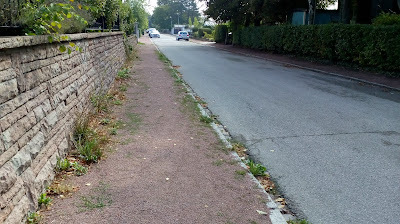 The photo below shows another shared path, but this time it's built continuously across the side road. A short distance further north and we have a roundabout junction with Geijersgatan which looking at Google Streetview, has been tinkered around with over the years. Currently it's a mish-mash of parallel crossings for walking and cycling and a partial annular cycle lane. The traffic signs for drivers show that only people walking have priority over traffic. The roundabout geometry is compact and so drivers are slowed down, but frankly, it's a work in progress! The shared cycleway continues and again, roadies stick to the road. In this section, the surface was a poor and so the road was more attractive. One thing I liked about Malmö was the quality of the cycling wayfinding. The signage was very clear and legible and pretty useful. The nice touch on the photo above is the square post to stop the signs getting rotated! 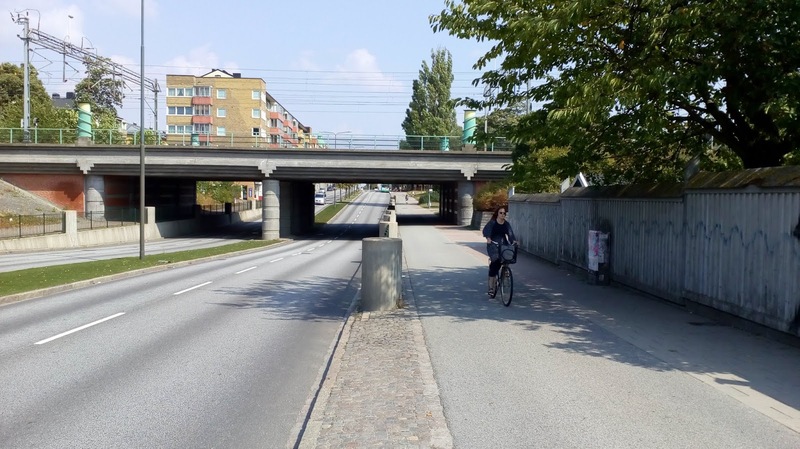 Still on Limhamnsvägen, there is a curious piece of grade-separation near the junction with Köpenhamnsvägen. Curious, because it quickly joins with paths on either side and doubles up a crossing on the main road (albeit just for pedestrians). It would have been more useful if it provided a traffic-free route through the residential area, but it's quicker than crossing the road when going to the beach I guess! There were few people walking on my day out which was just as well as there's another gravel path for walking. 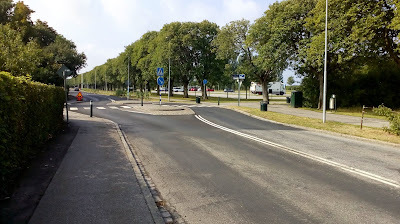 Above, we have a slightly more modern roundabout at the junction with Ribersborgsvägen. There's zebra crossings for people walking and cycle tracks with crossing points set back from the roundabout (where people cycling give way to traffic). Not a bad layout really. 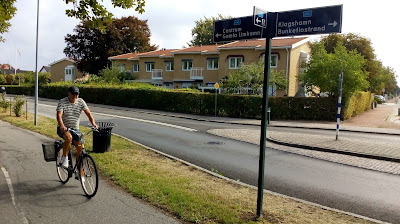 In a completely different part of the city, I rode along quite a large road - Lundavägen. Given it runs parallel to a grade separated trunk road, it's definitely a candidate for a road diet! 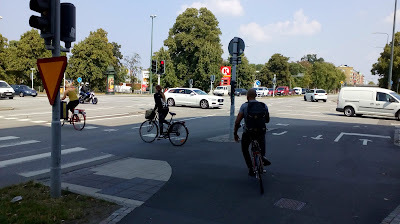 There are footways on both sides of the road, but with cycling only on one side within a two-way cycleway for quite a large part. This is far from ideal if you are wanting to access homes and businesses on the other side of the road. 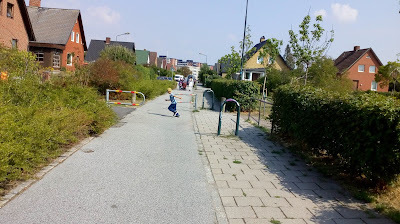 It's another part of the city with lots of development and as can be seen in the photos above and below, there's a bit of street upgrade going on with some repaving of the (existing) continuous footway and cycleway. For the most part, the footway and cycleway is at the same level with the former paved and the latter surfaced. Below, we have the junction with Hornsgatan which is another large road and is controlled with traffic signals. The staging arrange has people walking, cycling and driving all moving ahead at the same time with turning drivers having to give way to people walking and cycling. It's the common approach in northern Europe and while it works for people as they leave on a green because people walking and cycling are ahead of and can be seen by drivers, it's less comfortable if you arrive at the junction later into the stage because drivers are already finding gaps which can be very intimidating. 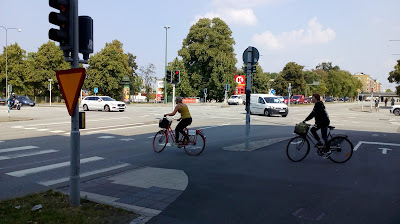 Left turns are in two stages and at there is some protection with islands separating people cycling from traffic. 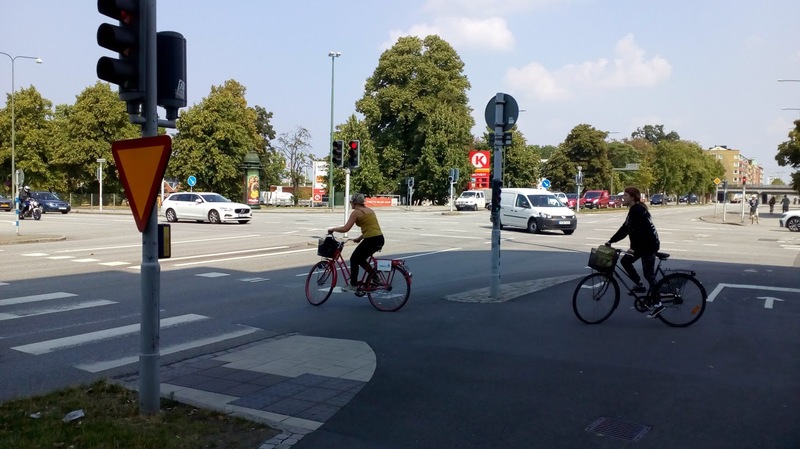 The arrangement is designed for road capacity and although at some junctions some movements are separated, the approach of running people across the three modes together makes for simple signal staging. You don't wait long to cross, but you have turning drivers. 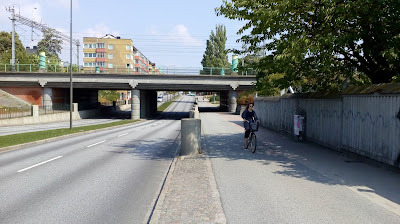 Above is where the road dips under the railway and it's a good example of where the footway and cycleway only dips by the headroom required by people rather than lorries so there is a gentle dip. 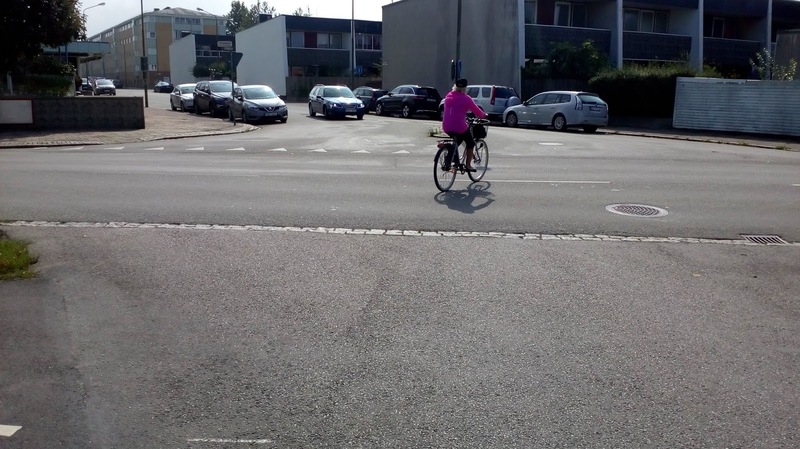 I rode this main road for a while, but took the opportunity to dive off into a residential area. 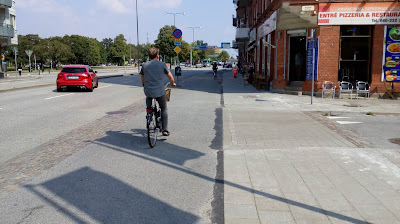 The streets were filtered with a combination of one-ways and modal filters. I wasn't sure if the one-ways allowed two-way cycling because there were no signs - my assumption was not. The photo below made me smile because I snapped the kid nipping across as I was riding and photographing the traffic-free link. Really, there was no danger as it was all slow and quiet. 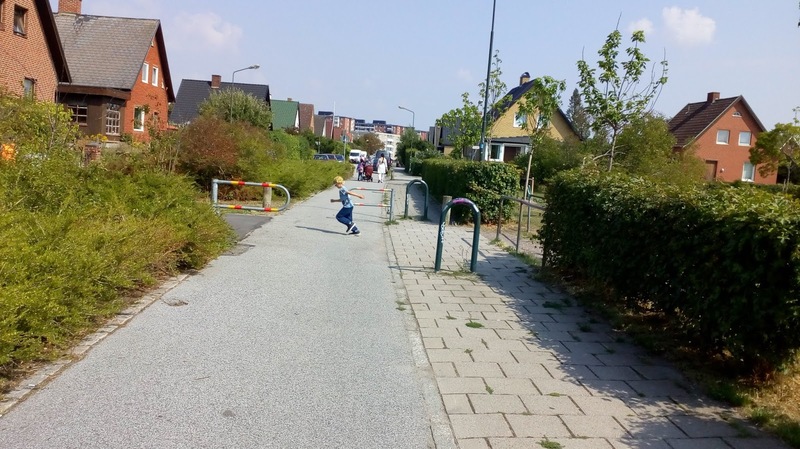 I then swung back out of the estate and headed back into the city and while it was clear that the infrastructure was compromised and poor in places, the fact it was available across the whole city meant that everyone could cycle who wanted to. I'll leave you this week with a little video from Lundavägen.